There comes a day where we all get a little too overwhelmed with all the things we’ve accumulated taking up space in our attics, basements, or garages. Lucky for us, there is a long standing tradition for getting rid of our old things, and even getting money for them, called a garage sale! Garage sales are a staple of suburban life, bringing together strangers and communities alike to uncover forgotten treasure! 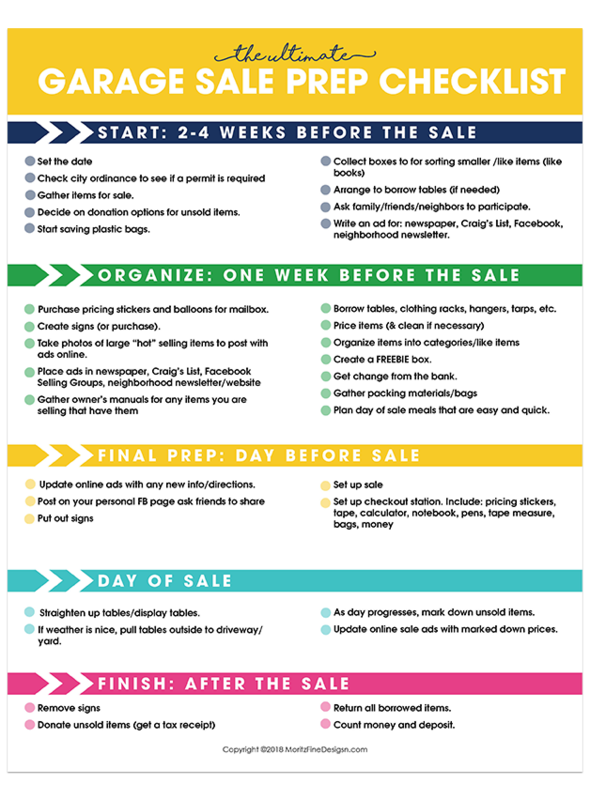 If you’re thinking about hosting a garage sale, using a Garage Sale Prep Checklist will help you put on the most successful garage sale ever. There are lots of details on the Garage Sale Prep Checklist but below are some of the items you need to really focus on. After setting the sale date, the first big things you’ll need for a garage sale are tables and blankets. You’ll need a lot of space to spread out everything you want to sell, and you can’t just put it on the grass! Make sure you have enough room for everything, a crowded table makes it difficult for customers to sort through and find things they’ll love. The last thing you want is people overlooking things, or even giving up altogether because they couldn’t see what was right under their noses! Blankets are perfect for placing under larger items that may not fit comfortably on your tables. Next, you want to be sure you have plenty of boxes. Most any type of box will do, from cardboard moving boxes to big storage bins. These will be great for keeping books together (face the spines up so people can see what’s in them!) or for sorting small items that may otherwise fall off your tables. For example, if you have a number of items that are a $1, you can easily add them all to one box and put a sign on the front it, saving you time from labeling each individual item. One thing to be careful of is actually using too many boxes. If people show up and only see a wall of cardboard boxes, they may not choose to spend time digging through them and just move on. Keep things visible! Don’t forget to find a good way to monitor your money throughout the day. A cash box and a calculator are must-haves. Garage sales are generally cash-only businesses, so there will be a lot of paper floating around all day. This is a good thing, but can go very wrong if you aren’t able to keep your money organized and safe. If you don’t already have a locking storage box or a small safe, go and get one before you host your sale. For a calculator, the one on your phone will do just fine, but feel free to use a dedicated calculator if you don’t want to leave your phone out on a table all day. You will need some way to price your items. I recommend you use your trusty label maker, but any sort of tag will do. You may decide you’re open to haggling, which is normal, but you should tag each item with a price to get the ball rolling. If you don’t label everything, you’ll spend more time panicking trying to think of what you feel an item is worth on the spot than you will actually selling anything! What is the first thing you ever see about a garage sale? The signs! You should make plenty of signs, and hang them wherever you can. Make sure they are large, visible, and able to be read from far away. You want people driving by to be able to read them and still have enough time to make the turn. You should put up a single sign and take a walk down the road to be sure your sign can be read before committing to a font size for all of them. The next item you should prepare isn’t really an item at all! You need to always have a good attitude before, during, and after your garage sale. A good attitude will sell more items than a price tag ever could! Make sure you greet everyone with a smile, and let them know you’re happy to help with anything. Think about the last time you had great service in a retail store, and try to mimic what made it so great for you. You have decided to turn your lawn into a store, so be the best employee you can be! Hosting a garage sale can be daunting for people who have never done it before. It’s not as hard as it seems if you plan ahead! 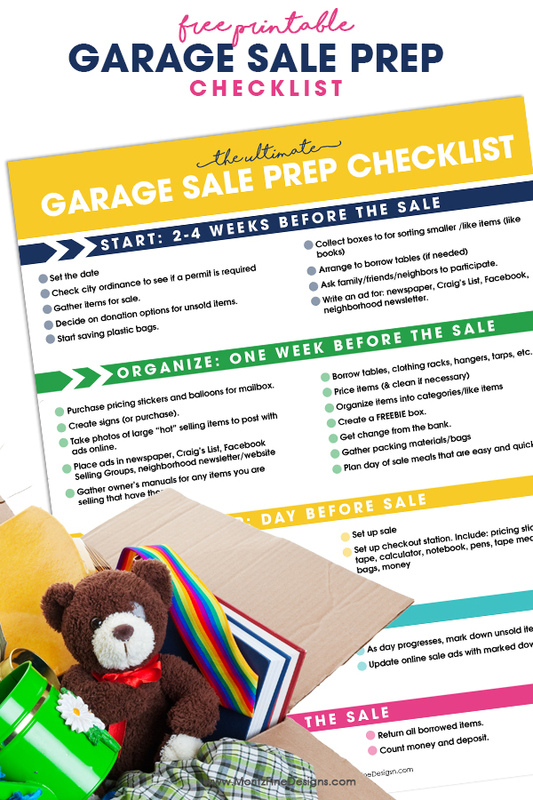 Try using the Garage Sale Prep Checklist in combination with the Daily Task Organizer for the perfect combination to help you prepare and get ready, have a good time and earn some extra money too! All our studies show we have more parking than we use. Why ask for more when we don”t use what we have? The garage revenue only covers ~25% of the annual cost of the garage. In the most crowded and broken intersections of the village, this council wants to add ~390 more trips each day. This council wants to triple meter rates and take a million more dollars every year from taxpayers who park on streets to subsidize the commuter garage. This council wants to fly in the face of experts who caution that self-driving cars will make garages like this obsolete. This council knows the garage funding plan will be opposed by the business they are trying help. Why is this council ignoring facts and reality? Transparency builds trust, this council Gerrymanders studies and ignores facts without answering why.